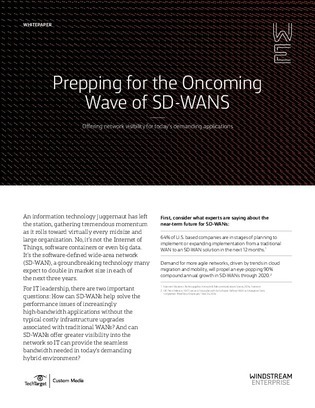 According to IDC, demands for more agile, cloud-friendly networks will propel an astounding 90% compound annual growth in SD-WAN adoption and implementation through 2020. To help you learn more about the key factors driving adoption, this custom article looks at the advantages that SD-WAN has over traditional WAN infrastructure for networking in cloud and digitally transformative environments. Learn about what changes you will see with the implementation of SD-WAN and discover 4 key criteria for evaluating vendors.